Beginning in the medieval village of Giannades we head over undulating trails with rapidly changing scenery to hidden Liapades. Here time stands still with tall Venetian manor houses and narrow cobbled lanes. Our second part of the walk, we will be accompanied by a villager and their donkey, along footpaths to the coast. This will be followed by a boat trip along the west coast to Paleokastritsa where we can stop for lunch (at own expense). Cruise by a traditional Caique before beginning our coastal walk along The Durrell Trail, below Mount Pantokrator, one of the most beautiful parts of the island. Through ageless olive groves to Agni Beach and Kouloura, we continue the path around bare headland with fascinating views to Albania. Entering the natural habitat Erimiti, stop for a picnic with drinks on a pristine beach. Transfer to what Lawrence Durrell called ‘the most beautiful view in Europe’, with fabulous vistas over Paleokastritsa and to the Byzantine Castle of the Angels. We follow a Roman footpath through olive groves to a medieval village before meandering down to a beautiful sandy beach. From Old Perithia - a semi-ruined Byzantine village located in a high valley - we start climbing and descending mule tracks and footpaths, through an oak forest gorge, to the olive groves and on to the sea where we may fancy a swim. We stop at a taverna for lunch (own cost). We’ll then travel onwards, along a spectacular footpath, to the Bay and Lagoon of St. Spiridon. The Kontokali Bay Resort & Spa is located in a beautiful spot with breathtaking views over the Ionian Sea towards Corfu Town. There is a sandy beach and plenty of watersports such as water-skiing and paragliding or if you prefer something a little more laid back, take the opportunity to feel thoroughly pampered, refreshed and revitalised with a treatment of two in the excellent spa (extra charge, book in resort). This hotel really will provide a fantastic base for your walking week. There is plenty to do and see on the days you are not walking. You may like to visit Corfu Town to take in the sights of St Spiridon Church, The British Cemetery and Mon Repos Estate and Palace. If you like being on the water then you could join a sailing trip to Albania and visit the ancient site of Butrint. Alternatively take a cruise over to Parga and Sivota. Excellent organisation. The hotel was first class in every way - helpful staff, excellent food and great facilities. The walks were all well planned and lunches were either included or available at local tavernas. The Tour Leader was excellent, welcoming and supportive throughout. Very enjoyable holiday blessed with good walking weather. Walks were varied and enjoyable. Really liked the boat rides, especially when we had the lunch at sea. Nice clean hotel with friendly staff and with the opportunity to use the pool or the sea. A good sociable week with wonderful people. Overall an excellent holiday which I would recommend. 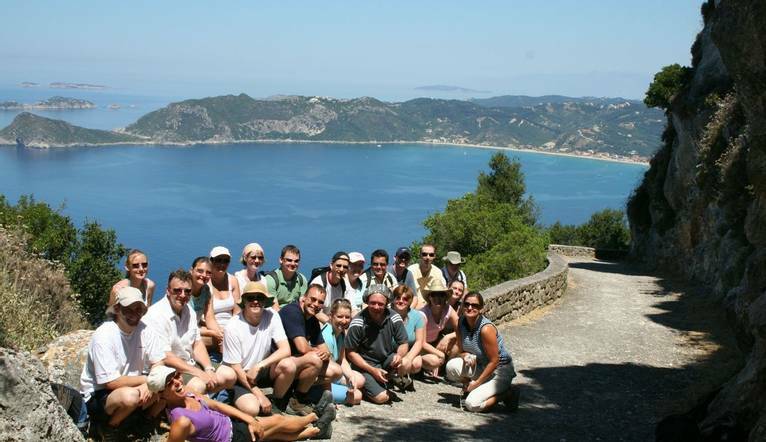 The transfer from Corfu Airport the Kontokali Bay Resort & Spa is approximately 40 minutes. Four guided walks are included in the programme. Your walking guide will advise you in resort of the daily programme. The walking programme is graded as Easy to Medium and you can expect to walk between 11 to 14km per day, with some ascents/descents, rough underfoot terrain and high altitudes involved. It is your responsibility to ensure that you are fit and well enough to take part in your chosen activity holiday. If you are unsure as to whether the walks are within your capabilities, please contact the office to discuss this matter, thus making sure you appreciate the terrain that you will be walking. You could be walking across uneven ground in some areas and extreme care must be taken, especially if wet. If used to using a pole/stick, it is advisable to bring it. Please appreciate the route and content of the holiday may change at the time and at the discretion of the guide/organiser, should conditions require. Solo’s Holidays Ltd cannot be held responsible for personal injury, accident or damage to property whilst on these walks other than incidents arising out of the company’s negligence. The guide has the right to refuse to guide a walk with anyone not properly attired.